The Wylie family homestead can be interpreted by examining the various barns and outbuildings situated on the property between 1835 and 1895, the time between the home’s construction and the death of Theophilus A. Wylie. Much of what is known about these outbuildings comes from a memory map drawn by Theophilus A. Wylie’s grandson, Theo Wylie (Theophilus A. Wylie III). 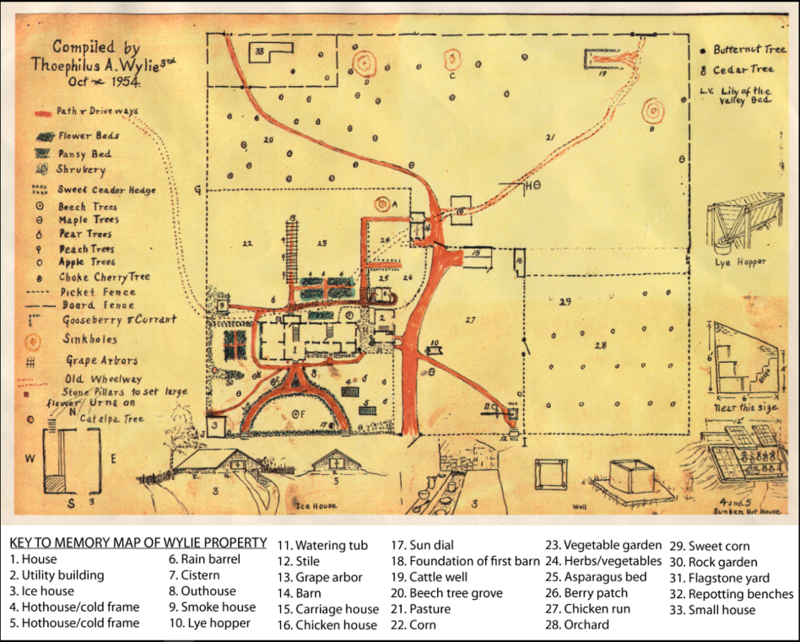 Theo’s memory map depicts his grandfather’s property circa 1875, although many of these structures likely date back to Andrew and Margaret Wylie, who first inhabited Wylie House and worked the 25 acre farm 40 years earlier. These barns and outbuildings help one understand the scope of daily life at Wylie House in Bloomington, Indiana in the mid-19th century. Family correspondence and journals kept by the Wylies relate details of construction, use, and occasionally, the tragic loss of their buildings to fire. Indiana University’s first president, Andrew Wylie, owned approximately 25 acres of land on which his home, Wylie House, was built in 1835. 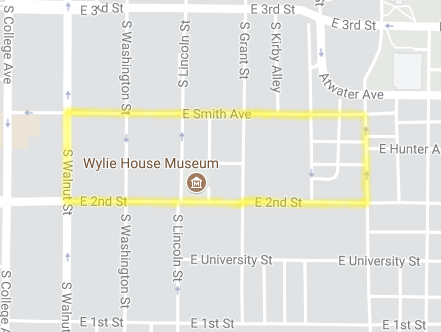 The homestead’s western and eastern boundaries correspond to what are now Walnut and Henderson streets and the homestead’s northern and southern boundaries correspond to what are now Smith and Second streets. The Wylie family homestead was a working farm. Hired help was particularly difficult to find for the first Wylie family, so much of this work was done by the Wylies themselves and their occasional student boarders. After Andrew’s death in 1851, Margaret Wylie lived at Wylie House until her death in 1859. Andrew Wylie’s second cousin, Theophilus A. Wylie, lived at Wylie house with his family from 1859 until his death in 1895. Theophilus’ family remained at Wylie House until 1913. Theophilus’ grandson, Theo, drew a memory map in 1954 of his grandfather’s property circa 1875. We know from family correspondence that the chicken house was converted from an old corn crib on the property around 1862. The original Wylie barn was a double-pen barn. A double-pen barn is one in which two single units are joined together at the top with room for passage underneath. This allowed a farmer to pull his wagon under the barn for easy loading of hay into the hay loft. A corn crib was a log granary used to dry and store corn. Their slatted design allowed air to flow through the crib to dry the corn inside. Corn cribs were built to be raised off the ground so that rodents and other pests couldn’t get inside through the slats. They were often located near livestock, as corn was a popular feed. It is likely that most of the outbuildings dated back to Andrew and Margaret Wylie’s occupancy between 1836 and 1859. The 1859 inventory lists eight horses, one mule, five hogs, and more than a dozen cattle. Since we know there was a chicken house, they must have also kept chickens. The numerous outbuildings underscore the vast amount of work that was required to maintain a working farm—butchering, smoking and salting meats, gathering wood for the winter months, preserving foods, and laundering clothes. It is believed that Theophilus A. Wylie took this photograph in approximately 1890 of the east side of the house. 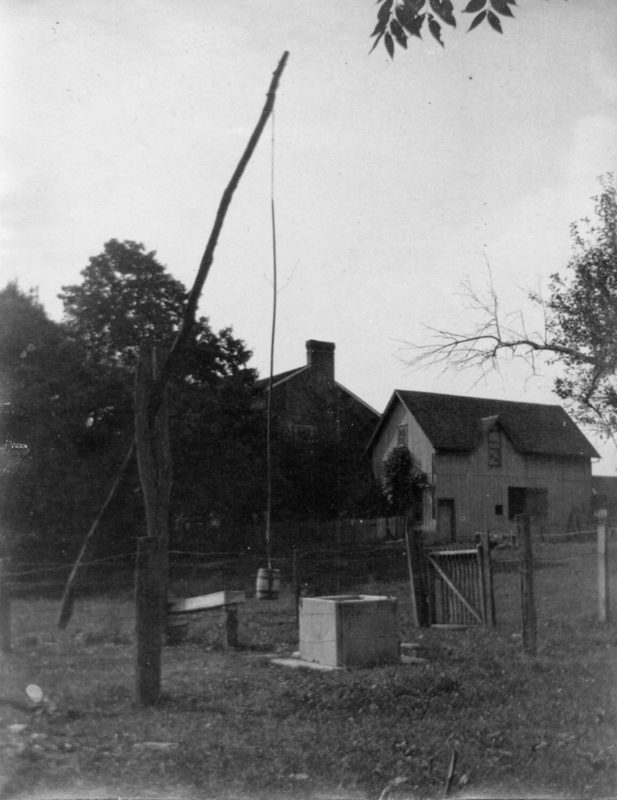 Shown here are the well and the utility building. The utility building just off of the kitchen was constructed during Theophilus A. Wylie’s time at Wylie House. He used the second floor of the building as his personal workspace. The sketch below shows his carpenter bench, weather observation window, lathe, and resting quarters. The first floor of the building was used by the family and hired help for storing wood for their stoves and fireplaces and for laundering clothes and cooking. 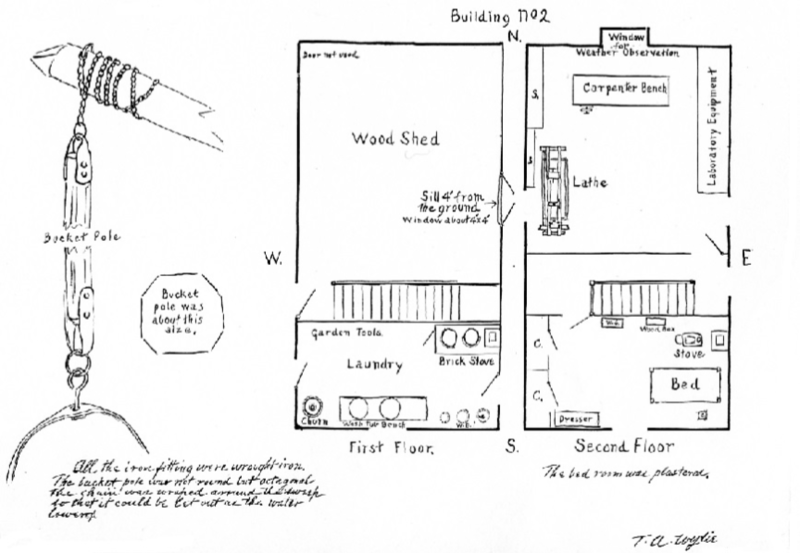 This sketch of the utility building, shown in the photograph, was drawn by Theophilus’ grandson, Theo Wylie, in 1954. 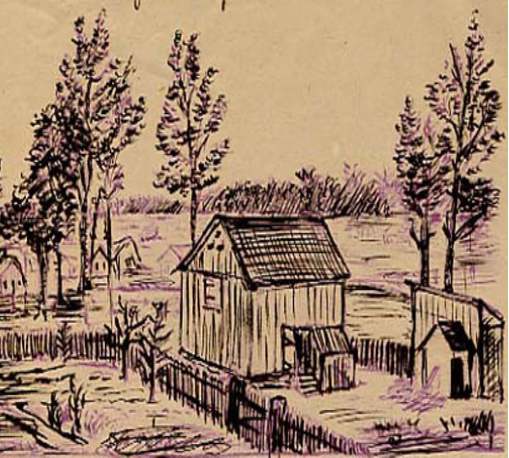 This sketch, drawn by Theophilus A. Wylie in 1883, shows his barn as it stood on Saturday March 17th at 6pm and the same time the next day after the barn burned to the ground. Before and after sketch of TAW’s barn after it burned down in March of 1883. Below is the transcription from his diary where he tells the story. transcription made from 3 April 1881-6 September 1885, Theophilus A. Wylie papers, Collection C202, Office of University Archives and Records Management, Indiana University, Bloomington. There are also two newspaper articles from the Bloomington Progress Vol. 16 (49) in March of 1883 that recount the arson, as many buildings were set on fire by arsonists that spring. The larger article, “Bloomington’s Bad Blaze” on page 3 chronicles a fire that was the most destructive in Bloomington’s history at that time. Andrew Wylie’s son, Reddick Wylie, lost property in the fire. 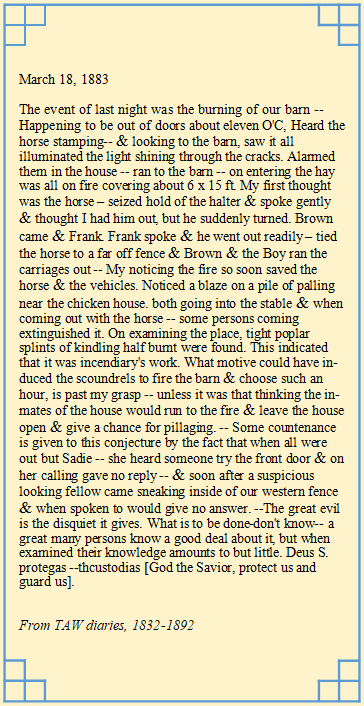 The second article, “Another Fire Last Saturday Night” provides details about the burning of Theophilus A. Wylie’s barn. 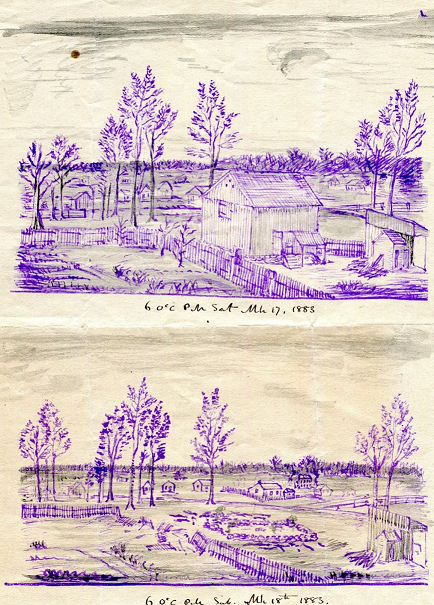 Before and After drawings of Wylie House Out Building Fire, undated, Theophilus A. Wylie papers, Collection C202, Office of University Archives and Records Management, Indiana University, Bloomington. Wylie House, Yard with Out Buildings, undated, Theophilus A. Wylie papers, Collection C202, Office of University Archives and Records Management, Indiana University, Bloomington. 3 April 1881-6 September 1885, Theophilus A. Wylie papers, Collection C202, Office of University Archives and Records Management, Indiana University, Bloomington. Wylie House Docent Manual, 2011 ed., Wylie House Museum, Indiana University Libraries, Bloomington. Utility building photograph, 2005.003.1155, 1890-1898, Wylie House Museum, Indiana University Libraries, Bloomington. TAW III’s memory map, 1954, Wylie House Museum, Indiana University Libraries, Bloomington. Bloomington Progress, Vol. 16 (49), 21 March 1883.